WE HAVE A WINNER for our Final Twilight Poster Contest! Congratulations to Ashley for being randomly chosen as the winner! Thank you to everyone who entered, and thanks for all of your patience as we chose a winner. On December 7th, 105.1 The Buzz spoke to Lana about the recent “Breaking Dawn” casting scam, as well as rumors about upcoming film production in Oregon. 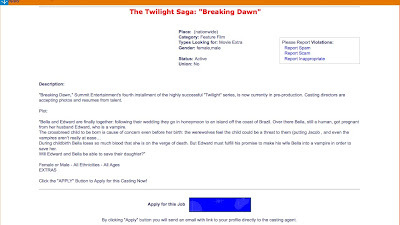 Not to beat the subject into the ground, but ever since my original blog post about the “Breaking Dawn” casting scam that’s being advertised all over the Internet and landing in people’s email inboxes, I have received tons of messages asking whether casting calls on other sites are also a scam. ALL CURRENTLY ADVERTISED CASTING CALLS FOR BREAKING DAWN ARE FALSE. Breaking Dawn is not yet in production. When it does go into production, professional casting directors will be hired to cast it. Any website or company claiming that they can get you an audition for “Breaking Dawn” and then asks for ANY money whatsoever is not a real casting company. Real casting directors don’t have websites where people are required to pay money to submit themselves for jobs. They will never see the supposed audition tapes that the “casting scouts” on these websites are promising to forward on to them. 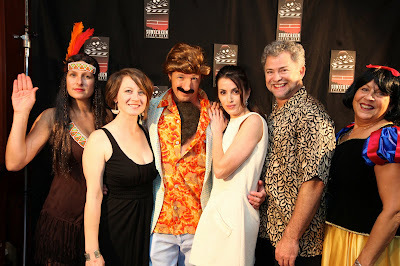 Real casting directors in the US are usually members of CSA. Their resumes can be found on IMDb. The CDs that Summit hires will work with professional talent agencies to hire the principal roles. Real talent agencies do not charge their talent any money to be represented. They only make commissions when their actors book jobs. Real agents represent established, professional actors who were either referred to them by other professionals or whom they have previously seen perform on stage or film. They do not scout for talent in shopping malls, on Craigslist, in banner ads or in spam emails. Real agents do not run acting or modeling schools, especially ones that charge thousands of dollars. Real extras casting directors have offices, staff and phone lines. They are usually based in the area where the film will be shooting. Their resumes can be found on IMDb. They will widely advertise open casting calls for background actors (if any are needed) on the TV and radio stations in the city where the film is shooting. The casting call will be free to attend. You should never have to pay to audition or to find out the location of an audition. They will not seek to hire extras who live outside the shooting area. They are not interested in dealing with travel complications that could arise from hiring an out-of-town extra. And they certainly won’t hire someone who doesn’t already have working papers. If you want to be an extra on a film, the harsh reality is that you need to live in the area where it is shooting and there’s no guarantee you’ll even be chosen to work. I hope this clears up everyone’s questions. Please spread the word, as many people have not heard this information, and judging by my inbox, are still falling prey to scam artists everywhere. You can read my previous blog posts on this subject below or by clicking “Scams” in the Labels section in the right sidebar. As mentioned before, if we ever get any real news about “Breaking Dawn,” we’ll post it here and pass it on to our Twihard mailing list. Be safe, do your research and always use common sense. Acting/Modeling Schools that Double as Agencies? PORTLAND, Ore. – It’s a teen sensation and, wouldn’t you know it, the popularity of the Twilight movies has some preying on those who want to be part of the next movie in that series. 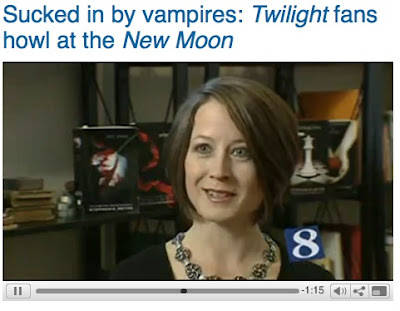 KATU’s Bob Heye talks to Casting Director Lana Veenker about the “Breaking Dawn” casting scam. If you’ve been around my blog for a while, you know how much we hate, HATE, HATE scam artists who prey on aspiring actors and movie fans (especially kids) with fake casting calls. A new one involving Breaking Dawn, the final installment in the Twilight series, has come to my attention. BE WARNED! As I’ve done in the past, I’m going to dissect it, show you all the red flags and demonstrate how I did the research to uncover the scam artist behind it all. So next time you get an email like the one below or see something online that sounds too good to be true, you’ll know how to dissect it yourself to find out if it’s bogus or for real. Take note! By the way, I’m not going to post the name or URL of the company and give them free traffic, but this was forwarded to me from a real talent agent, whose client (a minor) received it. The girl did not have a profile on this scam website and doesn’t have any other publicly viewable casting profiles online. So the first question is: How did they get her contact information? When her mother replied to the email to inquire, the email bounced back: “no such mailbox.” Major red flag. I would have deleted this as spam right then and there. But let’s dissect the entire message anyway! Subject: Salem Area Movie Extras Needed for Twilight “Breaking Dawn” Casting in Portland. <---RED FLAG! All Ages Wanted, No Experience Needed, Make up to $300 Per Day! Shoot location has not been announced, so no casting is taking place in Portland. Also, productions never hire extras casting companies until a few weeks before principal photography is starting. Last I heard, Breaking Dawn won’t shoot for another six months or so. Casting directors don’t casually browse the Internet and contact people individually to work as extras. You think we’ve got time for that kind of thing??? If a CD needs a thousand extras, he or she will contact all the TV and radio stations, announce a casting call and get everyone to show up at once. Or, if they have an established extras casting company, they will contact extras in their existing database and check their availability for specific dates. “No experience is necessary, all looks/types are wanted and the pay ranges from $80-$250<---RED FLAG! per day depending on whether it’s part or full time. “Casting starts next Monday<---RED FLAG! so you will need to register (FREE REGISTRATION)<---RED FLAG! as soon as possible. It will be lots of fun, a great way to make connections in the industry and pays well!<---RED FLAG! “If you are interested CLICK HERE TO APPLY (registration is free).”<---RED FLAG! Where to begin? First of all, we know extras casting doesn’t start next Monday, BECAUSE THE FILM ISN’T EVEN SHOOTING YET. Yes, principal actors sometimes get hired well before production starts, but not the extras. Next, the words FREE REGISTRATION are misleading: You can indeed register (i.e. give them all your contact information) for free on their website, but you can’t view the casting call details unless you PAY (more on this later). Real casting calls are widely publicized and FREE. Also, the subject line of the email promises up to $300/day. This part says they can earn up to $250/day. In reality, extras earn a lot less than that. And only stand-ins even come close to working full-time as extras. The work is very sporadic; usually only a few days here and there. We’ll discuss what happens when you click on CLICK HERE TO APPLY in a bit. “David Fox / Portland Casting Scout”<---RED FLAG! David Fox is a dubiously generic-sounding name. Plus, I live in Portland and I’ve never heard of him. A Google search for “david fox” + “casting scout” returns zero results. Nobody calls themselves a casting scout, unless they’re trying to get money out of you (in my experience). We are casting DIRECTORS. A Google search for “david fox” + “casting director” doesn’t turn up anything useful, either. If by some stretch of the imagination, I don’t know him because he just arrived in town for this specific project (which is not possible, since the shoot locations of BD have not been announced), he would at least have a resume on IMDb, right? Wrong. IMDb has no listing for an extras casting director named David Fox. Do you really think Summit Entertainment would hire someone with NO casting experience to work on their blockbuster movie? Check out the resume of the extras CD who cast their last film. THAT’S more like it. “PS: We are the entertainment industry’s way of casting new faces and talent all around the world for movie extra roles.<---RED FLAG! With over 300,000 members<---RED FLAG! and thousands of Industry professionals (producers, directors, agents and photographers) [SCAMMY COMPANY] is the right place to find jobs! Thousands of jobs now available in all 50 states. 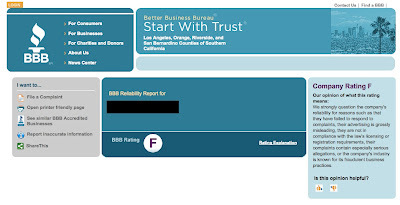 We have been in business since 2005 and are a proud member of the Better Business Bureau.”<---RED FLAG! Aah. So now we discover that our beloved David Fox is not the extras casting director of Breaking Dawn, but in fact he works for a website that he claims industry professionals use. Sorry, but professional extras casting directors have their own databases of local talent. They don’t hop on these websites looking for extras, otherwise they’d get swamped with useless submissions from around the world. Extras are always cast LOCALLY. Oh, their scammy website probably has casting calls for some low-budget freebies, posted by indie filmmakers who don’t know any better, but no major production company is going to use a company like this. When they arrive in a shoot location, they hire a LOCAL casting company, with an actual office, phone lines and real people behind the desks. If that wasn’t enough to convince you that the company is a scam, let’s check out what happens when you click the link in the email. “Female or Male – All Ethnicities – All Ages <---RED FLAG! “By clicking ‘Apply’ button you will send an email with a link to your profile directly to the casting agent.” <---RED FLAG! Nobody does a nationwide extras casting call. That would be insane. Why would a casting director want 20,000 emails from extras who don’t even live in the right area? Extras casting is done LOCALLY. Period. There are plenty of people who live near the shoot location, so there’s no reason for production to hassle with the myriad travel complications that could arise from hiring someone out of the area. If you want to be an extra on a particular movie, you’ll just have to move to where it’s shooting first. Extras casting directors already have too much work to do and way too little time. They prefer to hire extras whom they’ve worked with before and trust to show up on time and behave properly on set. At the very least, they want local extras. The links to report scams, spam and inappropriate content do not allow you to send a message; instead, they lead you to the registration page. 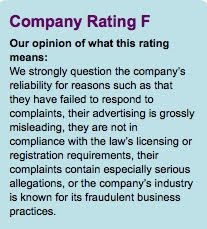 I was not going to give this sketchy company my contact info just to report a complaint, so I read the Terms of Service to see if I could find any contact information there. The two email addresses I found in the Terms of Service where one can supposedly file complaints (abuse@___.com and legal@_____.com) both BOUNCED. Next, I conducted a WHOIS search on the company name, but only came up with the contact info for a private registration site that keeps the registrant’s name anonymous. So, I did a WHOIS search on the domain name of the email address in the original email and–BINGO!–I found a certain Richard Fox (hmm, same last name as David–what a coinkidink!). * 1 registrar has maintained records for this domain since 2006-10-23 with 1 drop. * This domain has changed name servers 2 times over 2 years. * Hosted on 3 IP addresses over 3 years. * View 15 ownership records archived since 2007-11-27. * 3,881 other web sites are hosted on this server. In other words, a guy who spends a lot more time making money off websites than doing any actual casting. I’m sure our wily Fox is making a pretty penny off Twilight fans who did not recognize the scam that this is. And that makes me mad! Please feel free to share the link to this page with everyone you know. Don’t let others fall prey to creeps like this. [Also edited to add: Any “Breaking Dawn” audition advertisements that may appear on this blog are doing so by using keywords and are not endorsed by us. We do our best to block websites from placing bogus casting calls on our site, but some may slip through the cracks. Caveat emptor! After our look-alike contest, our drawing contest, and our haiku contest, we have come up with one more contest to give away one last poster. Who is your favorite character in the entire “Twilight” saga and why? To answer and enter for your chance to win, go to the contest form. Provide your answer in 100 words or less. Answers that exceed the word limit may be disqualified. You’ll be asked to provide your name and your email address, too. Since you’re participating in a “Twilight” contest, we think you’ll want to be added to our Twihard mailing list, if you’re not on it already. When we add you to our mailing list, you’ll get a welcome email. Want to keep receiving updates about the series and notices about fun contests? Then just sit back and wait for the emails to come rolling in. Not interested in being on our mailing list? Go to the bottom of your welcome email and click the link to unsubscribe. You can unsubscribe at any time, and we’ll never sell your information. Contest ends at 11:59 PM Pacific on December 14, 2009. One winner will be chosen at random from all qualified entries and announced here on December 15, 2009. These posters are only for the TRULY obsessed “Twilight” fan. But didn’t you have 5 posters to give away? Yes! As many of you suggested when we were first looking for contest ideas for these rare posters, the 5th and final poster has been donated to help raise money for the Oregon Food Bank. Don’t forget, in order to have a chance to win, you must fill out the contest form. Experience New Moon Prize Giveaway Continues! Excellent news for “Twilight” fans: The organizers of Experience New Moon still have some prizes to give away, including some signed items given to me by the “New Moon” cast to raise money for the Oregon Food Bank, so they are extending the celebration through to Christmas! For those who couldn’t make it to the New Moon release weekend, we have continued the Oregon Food Bank fundraiser, Self-guided Twilight Set Tour, Twilight Scavenger Hunt, giveaways and drawings. They will be giving away one prize each Monday until Christmas week! Read up here on the making of the movie and support Spooky Dan’s efforts. Click here to watch the first “Twilight” puppet video. Mailbag: Another Heapin’ Helpin’ of Your Questions Answered! Here we go again! The questions keep rolling in, so we collect them here and point you to the answers. Enjoy! CAN I JOB SHADOW OR INTERN WITH YOU? Q: I would be so honored if you would consider allowing me to job shadow you for a week, a day, an hour; whatever you might consider. I want to be submersed in your day, to see what type of schedule you keep for balancing and managing your own personal life, as well as your work, industry terminology, practices and protocol. I feel that I could learn a great deal from you. Please let me know if you will consider this! I promise to stay out of your way, and even be helpful if there is something I could do for you! A: Most of the time, it’s not possible for us to accommodate these kinds of requests. We occasionally take on casting interns, if they can make arrangements through an accredited school program, but our files are already full of would-be interns. If you’re still interested, you can mail a hard copy resume and cover letter for our files to the address on our website. ARE YOU AUDITIONING FOR THE “TWILIGHT” SAGA? Q: I had a question and im hoping you can answer it. I was wondering if it would be at all possible to audition to be an extra in one of the Twilight movies, even if the person auditioning doesn’t live in Washington? Thanks so much for your time! Q: I wich really to become an “actress”, I do what I can to get there smoothly. I hope that you could meet me for the cast of the twilight’s saga for example and if its possible (or other movie) … I’m not a “fan”, Im a serious and realistic. I hope you read this message soon. Q: I’m sixteen and I’m spanish. I’m a big fan of Twilight, and I want to know about Breaking down casting. I think that I’m not a normally fan. Twilight changed my mind when I was in a difficult moment of my life. It helps me to go ahead and it taught me that the best things are hide in somewhere. Sinceraly, my dream is to do the film that changed my lifestyle. A: Back in February, we answered a gazillion Twilight/New Moon questions. The long and short of it is, “Eclipse” has wrapped production and we know nothing yet about the casting of “Breaking Dawn”. If we do hear any news, we’ll be sure to post it here. In the meantime, head to the February blog post to read some insights as to how things usually work in the business. We also highly recommend checking out the blog archives. Scroll down to the Labels section in the right sidebar and check out the “Tips” label, for starters. For those of you who don’t live in the United States, check out the Q&A below. CAN I AUDITION FOR YOU IF I’M FROM OVERSEAS? Q: I love acting, I’m Colombian, I do not speak English very well, but I think that you understand me, I would like to at some point you had me in mind for some casting although live in Colombia, perhaps if you saw you might like my performance. I would like a reply from you. Thank you. Q: i am 22 years old and I am an actor. I am from South Africa and i am currently visiting in Vancouver at the moment.I was suposed to see this agency in L.A but due to a visa problem that plan was terribly disturbed.I understand you are a casting director and involved in helping youngsters such as my self with potencial talent to be recognised.I can really say that i believe i have what it takes and just need that kind of break but also i need the opportunity to do it. At the moment i am a struggeling actor and just need some help.i really believe in myslef and believe i can add another facet to the industry.I just need a leg up. So i would really appreciete any kind of help and would take it with both hands because i’ve worked twice as hard to get here. This blog post answers the general question, “Is it possible to get hired on a film shooting in the US or Canada if I live overseas?” Topics covered include work papers, actors’ unions, stars vs. non-actors, day player roles, and extras. Sooo many burning questions…so little time! What if you live in Europe and want to be cast in something shooting in North America? Read up about it here. IS THIS CASTING CALL A SCAM? Q: I see you’re a casting agent, so I was curious as to whether or not you’d heard of a company called Explore Talent. I got a call from them today regarding jobs in Portland, but the call seemed hoaky. Especially because it comes a day after I spent a day on the Leverage set. This is only the second job I’ve done (the other was for Untraceable a couple years ago) and the only “profile” I have is with [a couple of extras databases in Portland]. I’m taking my new career path very seriously and because I don’t have a ton of experience, I don’t want to be taken advantage of. Because your company has an excellent reputation, I thought I’d check with you to see if you have anymore information about the place before I field anymore calls. I’ve visited the website but can’t get a feel for how legit the company is. Any help you can provide would be greatly appreciated. A: Not being familiar with Explore Talent, we can only tell you that it’s not a site we use. Head to this blog post to read about the kind of sites casting directors to and don’t use (under question #2). If you’ve been a long-time reader of this blog, you know that acting and modeling scams really deep-fry our turkeys. This post dissects the anatomy of a scam and the red flags you should be on the lookout for if something sounds too good to be true. CAN YOU PASS SOMETHING ON TO A CELEBRITY FOR ME? Q: I’m Italian and my English is not perfect, but I will do my best. I’m a writer, but the reason why I’m writing this message to you is because I’d like to do a “present” to a good friend of mine. I have a little request, and believe me I am sorry to disturb you with a request like this, mostly because I guess you’ll get many 🙂 This dear friend of mine (she is from Argentina) is a big fan of Rob Pattinson (whoooa, what a surprise.. ha!) and she would like to send a letter to him (no screams on the letter, I swear…). She regrets not having the money to do it (sending by airmail is too expensive for her right now) and so she sent me an e-mail with a PDF file and asked me to do it for her. No problem for me, but I don’t know the right address for sending this letter. I read that Mr. Pattinson has an agent in London and an agent in LA, could you be so kind to write me an address where I can send this letter? An address where there is at least a small chance that he can read it. She is so cute, and I’d like to be able to do this for her. I wish to thank you in advance and I really hope you could forgive (and understand) my request. A: Since the release of “Twilight”, we have received similar notes from fans sent to us in the hopes that we can forward letters or trinkets on to their favorite stars. Unfortunately, we simply can’t do it. However, doing a Google search for an actor’s fan mail address is a good place to start. Sending such items to an actual fan mail address will certainly get them closer to the star than sending anything to us will! HOW CAN I BREAK IN TO THE BUSINESS? Q: Lana, I really do not want to bother you like some crazy father but my daughter has dreams to become an actress. She is a model and she also has alot of interest in her by agencies but she truly does want to become an actress. Right now we live in Gulf Breeze, FL. I was wondering if we should relocate in order for her to pursue her dreams? I am just not sure if living here would help her career. Thanks in advance for any of your suggestions that may be helpful to my daughter pursuing her passion. Q: First of all, I hope you don’t mind me contacting you on facebook. I can imagine it must be nerving to cope with all those messages from random people, but I just have one single question. Beforehand a few words regarding myself. I am 18 years old and I am from Austria/ Europe. Plus I am very passionate about acting. I have been to boarding school in Scotland for 7 months, and that’s where my love for drama & acting really began, although I have always liked to simulate people and shoot short films with my sisters and friends. I had drama 8 hours a week plus additional training on weekends for our theatre performances. Back in Austria I took a short acting course. I am still reading my old scripts out loud or performing short scenes, and am trying to improve my acting abilities. The problem is, here in Austria, you do not have many possibilities in film acting. Moreover I would rather want to perform in an English film given that the language would be no problem. So now here is my question. I know that it is essential to have a casting agent, but I do not know how to get one. I am looking on the internet, but you never know who to believe and if it is a proper casting agency or not. So I would very much appreciate it, if you could send me the name and/or adress of a good casting agency in England, preferably London, so that I can gain ground in the acting business. Q: I was just wondering if I can have some advice about getting into the entertainment industry? Q: I just wanted to introduce myself and let you know I am excited to have found you on Facebook as I have heard nothing but great things about your casting stuff. I am a member of [an extras database] though I am looking for more stuff as I am a new but aspiring actor who has what it takes. I know you prob here it all the time. Lol. I just wanted to put my name out there in hopes of maybe being considered if you ever need a fill in, or you need someone for a part in a job you are doing. I have done a few Leverages which I have got great, long screen time in the middle of the camera, and some background stuff as well. I also have done a commercial which was fun. Because you are a professional, I just wanted to contact you in hopes of maybe being directed in the direction I need to go from here. I hope to one day meet you and you will be able to see me in person and see the person and vibe I give off. I sincerely appreciate your time and I hope to hear back from you, though I know you prob get many emails. I just wanted to introduce myself. A fellow friend of mine referred me to add you and get my name to you. I want to be involved, and it never hurts to get your name out. Q: I was wondering if you would add me as a friend and take a look at the photos and video’s of my two sons. One is 6 years old and is always begging to be in the movies. ( The R.L Stein Goose bumps series actually) Lol . I have never taken much thought to it since those movies are ages old but recently I have been looking into the biz for him. Feel free to remove me from your friends after you get a chance to look through them if you get a sec. The other is 9 months old and is soo photogenic and just an all around pleasure. He is a VERY VERY awesome temepered baby. I hope this is not weird. Thanks again!! Q: thanks for the add, are you like the owner? i‘m a struggling actor, trying to make it big some how soon I have no manager/agent because they won’t find me any good work, currently looking for new rep. I know all the big things happen with you guys how do I get involved? Q: I am a 14 year old kid, aspiring to be an actor. I have been in many plays, and a few documentaries (I have also been through many acting courses). The reason why I am messaging you, is to ask if perhaps you had any advice, or anything that could help me out. I will start anywhere, all I need is a boost to start off my career. If you would help me with this I would be forever in your debt. I just recently moved to Seattle, Washington, and I am trying to find some connections, or anything that will help me out with my dream. Q: I am trying to follow through on my dream of becoming a singer or an actress, but I’m afraid I have no clue on how to be noticed. Whenever you have time, I may need a tad of advice. Q: Hi Lana! I would love to send you my headshot and resume. I would love to be able to work with you :) Should I send you hard copies in the mail? If so, what’s the best address to get them to you? Q: So im very interested in becoming an actor and being a woman of your stature I think you would have the perfect advice for me so please give me any suggestions or tips that you may have for an up and coming actor like myself. A: “How do I break in?” We’ve answered this question before, in its many incarnations, but as you can see, it’s still the hottest topic on everyone’s mind. You’ll find a few blog posts for you to peruse below. We hope you all can understand that we simply don’t have the ability to answer individual inquiries. That’s what we hope you’ll use this blog for: a resource that you’ll read and learn from in order to find the answers. They are provided! True, none of the above questions are specifically about the Twilight Saga films, but head to this blog post anyway if you want to read about the building blocks necessary to get started in this demanding and competitive industry. Stepping out to take that first step towards your acting career by answering an open call? Don’t show up at the casting director’s door without reading these tips first. Not sure what an acting resume is supposed to look like? Wondering if your headshot says the right thing about you? Check out this post. Q: How can my 14-year-old get started in acting? Topics covered for young actors just starting out and/or parents hoping to help their child on the path to an acting career include training (a must! ), experience, and talent agents. How to know which casting websites to trust, which subscription websites are worthwhile, and how to find and verify a bona fide agency. Working out of the country, chances of an inexperienced actor landing a lead role, extra work, and more! I’M A PROFESSIONAL ACTOR IN THE NORTHWEST. WHAT ARE YOUR SUBMISSION INSTRUCTIONS? If you’re a professional actor living in Oregon or Washington and don’t currently have representation, you can send a hard copy headshot and resume to our offices by following the instructions on the contact page of the Lana Veenker Casting website. Keep in mind that we are not a talent agency and we don’t represent actors. But we do keep headshots on file. If you already have representation in the Northwest, you don’t need to mail us your materials. We’ll get them from your agent when we need them. I’M A NON-PROFESSIONAL LIVING IN THE NORTHWEST. HOW DO I GET LISTED IN YOUR EXTRAS DATABASE? If you’re not a professional actor, but still live in Oregon or Washington, you can head to the Rutabaga Background Casting website and follow the instructions there on how to be listed in our database as an extra. Occasionally, we send out casting calls to our extras mailing list, so you may have the opportunity to be seen if you are based locally. There is no charge to create a basic profile and be listed in the database. NOTE: Those options are for OR & WA RESIDENTS ONLY! If you don’t live in the area, do the research for your own ‘hood and nearby cities for casting offices. We only hire outside Oregon and Washington when we are doing national searches, which will be widely publicized on this blog and in the media. This is a little late, but we just got the DVD from the TV station! On October 26, 2009, in anticipation of the release of “New Moon,” Daytime spoke to Casting Director Lana Veenker at the NBC studios in Tampa, Florida. Veenker, whose company did the Northwest casting on “Twilight,” the first film in the vampire saga, talks about working in the business outside Hollywood. Once again, the holidays are approaching. It’s the time of year that we like to give a shout out to the non-profits that Lana Veenker Casting supports throughout the year. Please check out these websites and consider donating your time and/or money. It feels great! Started by Lisa Shannon, an author and activist from Portland, Oregon (and one of Lana’s closest friends), RFCW benefits victims of the world’s deadliest war since WWII. Lana Veenker Casting has sponsored dozens of women and their hundreds of children through Run for Congo Women, and has inspired others to become sponsors themselves. Lisa recently appeared on Oprah and her new book, A Thousand Sisters, will be released in the spring. This year, Lana participated in the Twilight Fan Trips Vampire Baseball event benefiting the Make a Wish Foundation which gives hope, strength and joy to children with life-threatening medical conditions by granting wishes. An amazing organization that grants a child’s wish in the U.S. every 40 minutes. PATA’s Valentine Fund provides emergency cash when crisis strikes a member of the local theatre community, such as an illness or catastrophic event. It holds a special place in Lana’s heart, after an actor and close friend in her former theatre company was hit by a car on his way to a performance. The Valentine Fund helped him pay rent while he was unable to work. Oregon Food Bank reports that requests for emergency food have skyrocketed in recent months. A $10 contribution helps them collect and distribute enough food to fill an emergency food box, feeding a family of four for three- to five-days. LVC has often held fundraisers and made donations to Oregon Food Bank and encourages you to do the same. When the three-year-old son of a local actress was diagnosed with leukemia (A.L.L. ), Lana Veenker Casting helped organize a blood donation drive in his name. LVC has also supported Twilight blood drives over the past few years. The Red Cross has a continuing need to replenish its supplies and needs all blood types. Here are some other organizations that LVC supports and recommends. Spread the love! Teenage girls (and probably a fair number of boys, men, and women) will be lining up for midnight screenings of New Moon, the film adaptation of the second novel in Stephenie Meyer’s vampires-meets-90210 Twilight saga. Twilight fans were disappointed when New Moon’s producers decided to shoot the film in British Columbia, after shooting the first film in the Northwest. The third film, Eclipse, has wrapped shooting, but star Robert Pattinson told MTV that Breaking Dawn, the fourth movie, will be shot in Portland. If it’s true, that’s huge news for the local film industry, and Twilight fans, who are sure to stalk the stars as soon as they show up. Pat Dooris talks to fans and industry veterans on the eve of New Moon’s premiere. Lana Veenker Casting is teaming with the coordinators behind the “Experience New Moon” event in St. Helens, Oregon to give four lucky fans the ultimate experience. Location Casting Director Lana Veenker and local members of the “Twilight” cast will be participating in a VIP party and panel discussion on Thursday, November 19th, part of the kick-off of “Experience New Moon,” a four-day release party that brings the vampire saga home to St. Helens, where several scenes from the first “Twilight” movie were shot. The event benefits the Oregon Food Bank and includes screening parties, a walking tour of movie locations, a Volturi Ball, scavenger hunt, “Twilight” character look-alike contest, raffle and more. Also on hand will be a beautician and esthetician from Forks, WA. Four lucky winners will be chosen to receive a “Twilight” vampire makeover. If you’d like to be one of them, register here for the drawing. Winners will be announced on Thursday, November 19th, 2009. For more information, please visit the Experience New Moon website. For its legions of female fans, the Friday opening of “The Twilight Saga: New Moon” is quite possibly the most momentous event since the invention of air. Anticipation has been fed by daily, breathless reports that “New Moon” stars Robert Pattinson and Kristen Stewart (aka “Robsten“) were dating; debates over the special effects which turn co-star Taylor Lautner into a werewolf; and drooling over Lautner’s newly buff physique. For all its global popularity, “Twilight” is forever tied to Oregon, where the first movie was filmed in 2008. Even though production moved to Vancouver, B.C., for the second and third films, Oregon and Southwest Washington were the backdrop for the movie that increased the heart rates of countless tween girls — not to mention middle-aged moms. 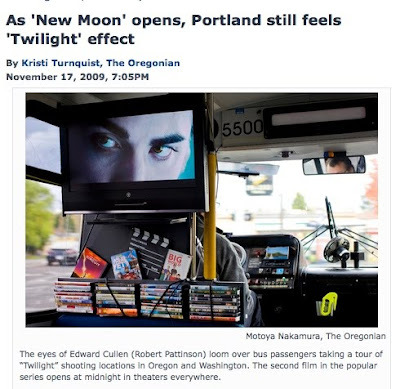 The region still gets a tourism boost from the industry that has sprung up around everything associated with “Twilight.” And buzz is building that the fourth film might return to Portland. Blood Drive to Celebrate "New Moon"
STARVE A VAMPIRE, DONATE BLOOD! Donate blood at the Clark County American Red Cross fixed site donor center on Friday November 20th, 2009 and register to be entered to win prizes which include a pair of tickets to a November 21st showing of “The Twilight Saga: New Moon” and a “Twilight” saga collection box set which includes all four books in the “Twilight” series. 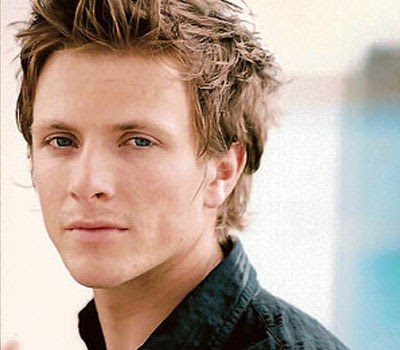 Today’s the day: LA premiere of "New Moon"
And met Charlie Bewley, who plays Demitri in “New Moon,” and whom I think fans are going to love. Wishing him luck on his upcoming projects. Sounds like he has a few amazing prospects on the horizon. These lucky ladies from Cullen Boys Anonymous are first in line for their spot on the red carpet. They’ve been camping out for days! Good luck, cast and crew! Hope you have a blast. Experience New Moon – Submit Your Questions! Lana (location casting director on “Twilight”) and some local members of the “Twilight” cast will be conducting a panel discussion at the Experience New Moon event’s VIP party in St Helens, Oregon on November 19th. Here’s your chance to ask what it was like to work on the first film in the “Twilight” saga, how to break into show business if you’re just starting out, or anything else that comes to mind. Planning on attending? Submit your question through this web form, and enter to win time with Lana and the cast at the event. Each submission is an entry. Winner will be announced at the VIP party on November 19th. Unable to attend? You can still submit a question! Event organizers will be posting a video of the panel discussion. “Twilight” fans everywhere are counting the days until the premiere of “New Moon.” I just got back from LA, where I got to catch up with some of the Wolf Pack, and believe me, they are as excited as you. Even though they have an exhausting schedule of press junkets and appearances from now until the premiere, they can’t wait to find out what everyone thinks of the second film in the “Twilight” saga. They told me how much they loved working with Director Chris Weitz and bonding as werewolves on the set. It was great to see them and I’m sending lots of well wishes for their big night on the 16th. I’ll be in Los Angeles to partake in some of the festivities and I can’t wait. Members of the Oregon “Twilight” cast (such as Young Bella and the Frat Boys) and I will be attending the VIP party. We will be doing a panel discussion and answering fan questions about what it was like to work on the first film in the “Twilight” saga, how to break into show business if you’re just starting out and more. Special Guest Anita Wheeler, a traditional Quileute story teller, will also be on hand sharing stories handed down to her from her elders. Proceeds benefit the Oregon Food Bank, so it’s all for a great cause. Fantastic Workshops in St Petersburg, FL! A great big thanks to everyone who helped make the Sunscreen Film Festival workshops possible this past weekend in St. Petersburg, Florida. Everyone from the organizers to the students were wonderful. Lana, just a note to say “thanks” for sharing your professional experience, expertise and information in your Actors Workshop this weekend. I was there with my daughter who really enjoyed herself and learned so much. We hope you’ll return to the Sunscreen Film Festival in the future…we’ll be there. Just wanted to thank you for making it out to the actor’s workshop. I really appreciated the stories about actors you’ve known who have taken extra steps in marketing themselves and therefore created “Massive Value” on their own. The workshop re-energized me by making me realize how far I have already come, but there are many more things I can do to further my career. Thank you. Thank you Lana for all of your valuable insight and thoughts in this industry. I know it touched and influenced myself and other actors for the rest of their professional careers!! Take care and can’t wait to work with you again! The workshop was a blast, and very educational. Thanks for sharing your wealth of knowledge. Thank you for taking your valuable time to share some of your life experiences with us. My daughter enjoyed your teachings and left feeling even more confident about herself. I am impressed with your teaching style which made it easier for my daughter to understand what she is getting into. I wish continued success to you and your firm. Thanks for coming to St Pete. I really enjoyed your class and learned a lot. I will definitely keep an eye out for any workshops you do in the future! Getting to know and learn from Lana Veenker was just priceless. Meeting Lana Veenker and sharing this weekend with such great group of talented people was wonderful! Thanks for a great workshop and inspiring weekend! I was really amazed at how much I learned at the Sunscreen Festival this weekend! I came backed charged and motivated. […] Lana Veenker’s workshop was so detailed and informative. It really opened my mind to so many new ideas and it gave me direction. I loved her airplane analogy. I now think I’m ready to start auditioning. Great seminar this weekend…really! Lana, don’t worry, no brownies enclosed! Seriously, I learned a lot. Thank you very much. Meeting Casting Director Lana Veenker revealed to be a very informative session in a casual & intimate setting. The Sunscreen Film Festival format is very interesting. The people/artists who come in are accessible in a non-threatening way. I say it’s PRICELESS! It was a pleasure meeting you at this year’s Sunscreen Film Festival. I learned a lot at your workshop and look forward to seeing you again soon! Amazing time at your workshop this weekend!! It was so real and inspiring. Thank you for helping us out! Come back to Florida soon! More headshot and resume feedbackIf you’d like Lana to teach a Tools 4 Actors workshop near you, please indicate your interest by clicking on the blue Eventful widget on the right sidebar of this page. You can also sign up for the Tools 4 Actors mailing list at the top of the page and follow this blog for updates. Coming soon: Lana’s interview on Daytime on Tampa’s NBC affiliate. Don’t touch that dial! KGW’s Pat Dooris interviews Lana Veenker and Psychologist Hank Robb on the crazy things people do to try and get on TV. Hot Story: Balloon Boy, the quest for fame. What a Hollywood casting director and a psychologist have to say about BB.